First of all, a very big HAPPY NEW YEAR to everyone! I hope everyone is looking forward to start 2009 with a big bang. Unfortunately for me, school is starting VERY soon and hence I’m going to have less time to dedicate myself into baking and I’m sure the updates will start to get slower. But hang on in there until the end of April, when I’ll have a FULL 3 months (hopefully) to do whatever I want. Keeping my fingers crossed, I do hope that I’ll be able to do some travelling, some work and of course, lots of baking during the three-month holiday. As the title suggests, today’s post is all about potatoes. Okay, there’s not much actually, just two. 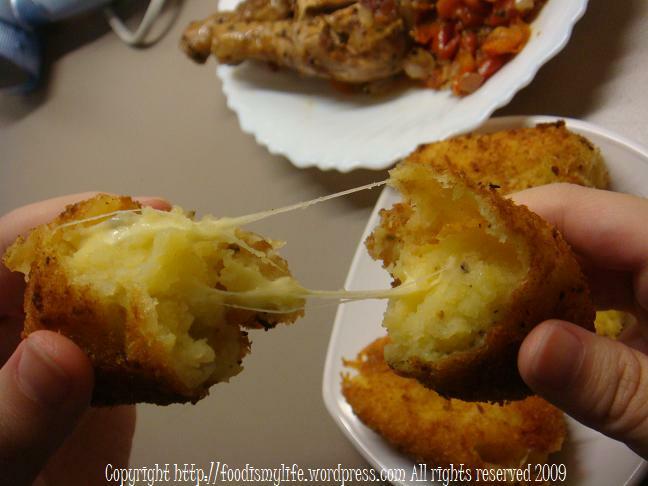 First is the Potato and Mozzarellla Croquettes as can be seen in the title. I made this when I’m in hostel today. For a potato and cheese lover like X, this really appeals to him (I think). Croquette is small fried food roll usually with mashed potatoes as the main ingredient. Sometimes, minced meat, vegetables, egg or milk can be mixed into the mashed potatoes and then shaped into a cylinder or disk, then rolled in breadcrumbs. They are then deep-fried until golden-brown in colour. 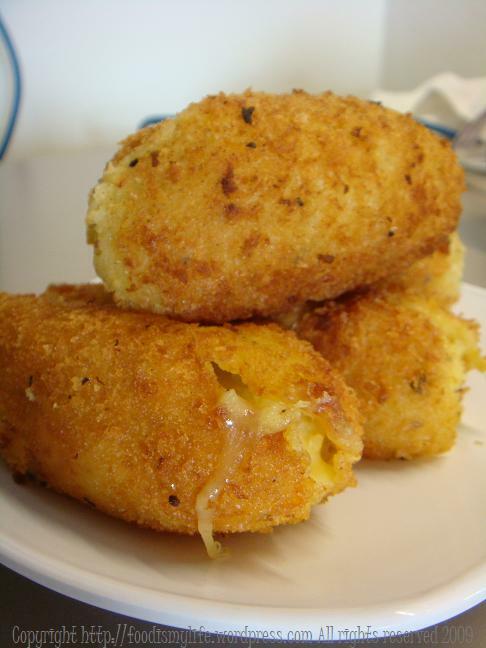 The word “croquette” comes from the French word “croquer” which means “to eat hastily”. I made these croquettes from David Rocco’s recipe. I watched him enclosing a strip of mozzrella cheese inside the mashed potatoes and hence I decide to try it out. I didn’t have the exact recipe so I just add whatever I can think off into the mashed potatoes. It was pretty easy, mashing cooked potatoes and then shaping into logs, wrapping a strip of mozzarella cheese along the way. Then I rolled them in beaten egg and coat them with Japanese breadcrumbs and then I pan-fry them in shallow oil until browned all over. The resulting croquette is yummy, and I really can pull the cheese. What I’ll try the next time to improve this is probably adding some milk or egg to help bind the mashed potatoes together, and of course, use more potatoes to make more croquettes! My another all-time favourite is fries. Seriously, who doesn’t love fries? I love good fries, hence I condemn the fries from fast-food chains. They are always over-fried and too heavily-salted and the oil they use tasted like yesterday’s oil. Fries should be crisp on the outside but still relatively soft on the inside. To me, that’s what fries should be about! And in order to make a relatively more healthier version, I made my own fries using the oven. No deep-frying involve, no yesterday’s oil, but baking and using olive oil. And the good thing about baking fries (other than the fact that it’s slightly healthier than deep-frying the fries) is that you don’t really have to be in the kitchen 24/7. Just set the timer and watch it turn into delicious and less sinful fries! And the best thing is that you are truly using 100% potatoes and a good oil. So why choose fries from fast-food chains when you can make your own fries? Okay okay, I think you get my point 😉 So without further ado, here’s the recipes! Peel and chop potatoes into small pieces. Place them in a pot; fill with enough water to cover and boil till soft. Drain well and return the potatoes back into the pot and stir constantly over low heat until the excess water has evaporated. Mash the potatoes and season with salt and pepper (add milk, egg or other ingredients as desired). Shape the mashed potatoes into a log and wrap a strip of mozzarella cheese in it. Roll the potato logs into the beaten egg and then roll in the Japanese breadcrumbs. Re-shape if necessary. Heat oil in a pot (it doesn’t matter how much oil you use, you just want enough oil to come up to 1cm in height). Sprinkle a few breadcrumbs into the oil, if the breadcrumbs start to fry, the oil is hot enough. Fry the potato logs, in batches if neccessary, until the outside is golden-brown. Drain well and serve immediately, with any favourite dips if desired. Peel the potatoes. Slice them into 1cm strips and place them in a pot. Fill with hot water and boil for 5 minutes. The potatoes will still be hard. Meanwhile, preheat the oven to 220 degrees Celsius. Line a baking tray with aluminum paper and drizzle with olive oil. Place in the oven. Drain the potatoes and return the potatoe strips back into the pot and stir constantly over low heat until the excess water has evaporated. This is very important to prevent the oil from splattering later on and injure yourself. Place a lid on the pot and shake the pot – as vigourously as you want – to roughen the sides of the potato strips. Tumble the potatoes into the hot oil and stir to coat the potato in the oil. Bake for 30 minutes to 45 minutes, turning the fries once during the course of baking. Drain on a kitchen paper and sprinkle with salt and pepper. Serve immediately. The fries were great! 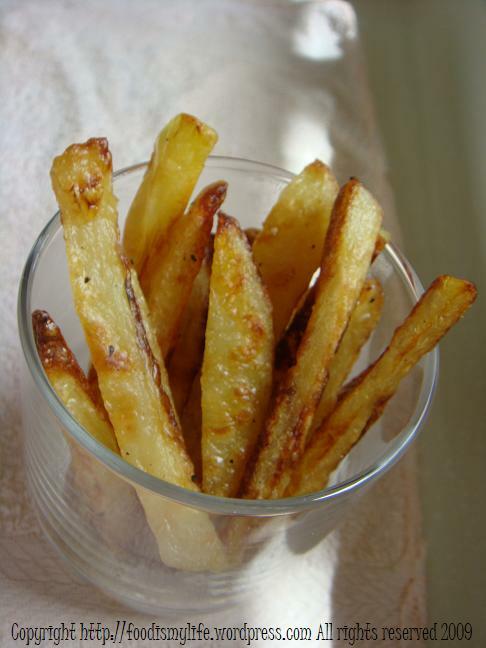 Finally a recipe that makes crispy on the outside and soft on the inside fries without frying! I used gold potatoes, cut them in wedges, and boiled them longer than 5 minutes. Who is mr X? your bf?